Iceland has been on my bucket list for quite some time and when WOW Airlines started flying there for cheap (round trip was just over $400) a few years ago, I’d always kept it in the back of my mind that I should take advantage of their deeply discounted flights. Sometime in August, my brother-in-law mentioned he might want to go to Norway and I said, “have you ever thought about Iceland?” Shortly after that, we decided to make it a reality and booked our flights. Iceland definitely wasn’t in the plan for 2018 but the opportunity fell in my lap, so I took it and I’m so glad I did! The flight over was 6 hours and they are 4 hours ahead of us. We picked our rental car up and stayed in Kopavogur the first night in a lovely Air Bnb. The next morning, we set out for the southern portion of the Ring Road, which is the main highway that goes all around the country. Leaving the city and driving into the moss covered lava fields was unreal. It looked like scenery straight out of The Land Before Time. Smoke was coming out of the ground in geothermal hot spots and mountains jutted against the skyline. Pictures really don’t do the country justice at all. Our first stop was at Seljalandsfoss Waterfall, which you can walk behind. You will get wet! So make sure to bring a waterproof jacket and shoes. There’s another small water fall a few meters away that’s semi hidden and you’ll need pretty tall boots to wade through to see. It’s worth it though. From there, we went to Skogafoss Waterfall, which is much more impressive and you can walk up a steep hill to view from the top. It was raining, very cold and the wind threw chilly water at our faces which felt like ice pellets. Not for the faint of heart! From there, we drove to Vik to visit the Black Sand Beach. Game of Thrones fans may remember the basalt caves and column from scenes where dragon glass was discovered. This was by far one of the most unique and beautiful places in all of Iceland. Do obey the warning signs about the waves – they were massively forceful and would sweep you out to sea in an instant. Our next stop was the breathtaking Fjardrargljufur, a massive canyon that looks like the entrance to Middle Earth. It’s not a very well known spot but I read about it on another blog and we felt it was well worth stopping at. I read that during the summer months, you can kayak down the river, which would be really fun! Total driving time for the first day was about 4 hours, but we spent quite a bit of time at each place so by the time we got to our hostel (Hvoll Guesthouse), it was dark. Also worth noting, if you do stay at Hvoll, there is nothing around for food, so make sure you eat before you check in or you will end up back tracking about 15 miles like we had to do. This was also one place where we had to share a bathroom/shower with about 35 other guests who all came on one bus together, so that wasn’t ideal but definitely out of our control. Here’s a map of our first day and the main stops in south Iceland. I just got back from eight days in Iceland but before I recap how the trip went, I thought I would take the time to share some things I learned while traveling in the land of fire and ice. Our trip was during the month of October, so you may find that if you go earlier, you won’t have to worry as much about winter weather or a chance of snow. If you’re traveling from the United States, you may be surprised to find that automatic transmission cars are few and far between. Just like the rest of Europe, Icelanders own and drive manual cars. Take this into consideration when booking a rental – automatic is normally much higher and since there are fewer available to rent, book your car before you go. We rented a manual because that’s what my brother-in-law drives anyway, so he did all the driving and that worked out fine for us. But if you have a group going and want to take turns but not everyone can drive a stick shift, make sure your driver gets breaks along the way. Pay attention to the road conditions. If you are driving the Ring Road or Golden Circle, most of it is paved. We ran into a few spots on Ring Road that were gravel, but had no issues driving them. We did not need a 4×4 since the F roads inland were closed (those are all gravel) and we couldn’t venture off road anyway. Check the road conditions online and note that weather can change in an instant. The wind can be extreme. Along the east coast, our car was being blown around the road quite a bit and if you aren’t an experienced mountain driver, that can be intimidating to feel like you’re going to be blown off a cliff and into the ocean. The Iceland Road conditions web site will also notify you of extreme wind conditions. Make sure you don’t run the car down to E. Once you get past the Ice Lagoon, there aren’t many gas stations between there and Akureyri. If you use your credit card at a self-service, unmanned station (there are a lot of those), you will need a PIN # for it to go through. Gas is also VERY expensive compared to the US. Expect to pay $9/gallon. Get the optional car insurance. You will drive on gravel and it will chip your car. Each chip is up to $500 but if you add the optional insurance, you can basically total the car and not have to pay a dime. Everyone recommends it and while I’m not normally one to add the insurance, everything I read said you need it and they were right. We got hit by loose rock every single day. Roundabouts are EVERYWHERE. We saw maybe four or five stop signs the entire time and that was it. The larger cities have traffic lights but if you can’t navigate roundabouts, you’re going to be in big trouble when driving through Iceland. You will absolutely need weather appropriate gear. I took a pair of rain boots, waterproof snow boots and a pair of winter Toms boots for airport travel and sunny days in the city. Tennis shoes were much too cold for October in Iceland. It rained the first couple days pretty much all day, then we had periods of showers a couple days after that. Invest in a good waterproof, warm coat and it will be a lifesaver! I bought a North Face down filled parka off Poshmark and it worked wonderfully. Wind resistant, water proof and warm, I wore it nearly every day. If you go in summer, a lighter rain jacket should be fine. Take scarves, gloves, and hats too – you will need them! I did not invest in waterproof gloves and they got soaked on day two and didn’t completely dry out until day five. I also took every fleece pullover I owned and layered over thermals and tanks. Jeans weren’t great for keeping my legs warm, so I’d invest in a good pair of fleece lined leggings. I found the pair I have kept the cold out nicely and dried faster than denim. Like I said earlier, the weather can change instantly. We had rain the first couple days, sunshine and wind the next, then drove through snow more than once in the northern part of the country. At one point, we were driving through mountains in snow and a few miles down the road the sun came out and we had to drive through sand blowing over the road! Also, Iceland is not the place to go to look glamorous. The wind and rain are not compatible with make-up or hair and I just gave up after a couple days. If you can’t go out in public without make-up on, you better get you some heavy duty waterproof stuff or else stay home. I used WAZE the entire time and was shocked at how well it worked. We didn’t get lost once and even when my cell service was spotty, the maps kept on working. Google Maps wouldn’t connect very often so I gave up on it with the exception of using it for walking directions in Reykjavik. I also took paper maps just in case. After gas, food is the next shockingly expensive item. Unless you’re swimming in cash, you can’t eat out every meal. A Subway sandwich was about the cheapest fast food item we found. Two street tacos at a Mexican restaurant cost me $24. If you’re looking to travel cheap, I suggest stopping at grocery stores or gas stations with good food selections – we often ate one meal that way so we weren’t spending outrageous amounts of money on food. You could easily spend over $100/day if you eat out every meal. We didn’t do hotels at all, instead opting for a mix of hostels and Air Bnb. Every place we stayed had shared kitchen space, so we could cook food and some even had shared bathrooms/shower space. If this bothers you, look to spend about $200/night on a hotel. Iceland is pretty much cashless. I took some krona with me just in case but did not need it at all. Everywhere I went, credit cards were accepted. Sheep are EVERYWHERE. They outnumber the people and many are free range. Watch out for them when driving as some are grazing by the side of the road. Most seem aware of traffic but we did have a couple run out in front of us so just make sure you’re paying attention to them. I just got back from my first national library conference in New Orleans. I had been to the Big Easy several years ago but only for a couple days, so I didn’t get to extensively try the food. I more than made up for that this time though! In my opinion, it doesn’t get much better than southern cooking and I was not disappointed. My plane landed around noon, so I picked up my rental car then quickly dropped my bags off at my AirBnB, then swung by Johnny Sanchez for lunch. I had the empanadas, which were SO GOOD and filled with plantains and chorizo, covered in cotja cheese and served with a cilantro ranch dipping sauce. They were excellent, although the portions were more appetizer sized and the prices on the high side. It helped tide me over through the opening conference session and until dinner. The first amazing meal was technically not in New Orleans, but in the small town of Slidell, which is north of the city. 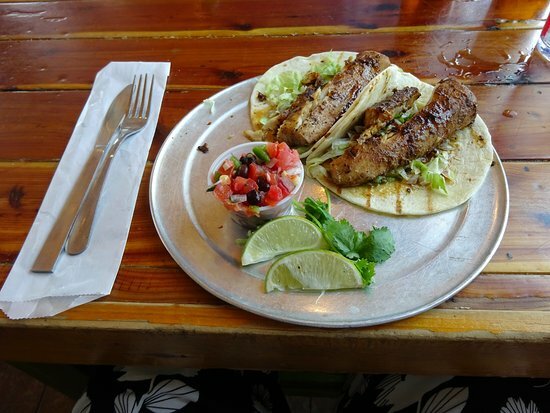 I met up with a friend at The Blind Tiger and tried some of their mahi mahi fish tacos. I’ll be upfront with you here: I’ve never had a fish taco and I really don’t care much for fish unless it’s fried or mild, like tilapia or mahi mahi. So I went outside my comfort zone here and IT PAID OFF. These tacos were so delicious! I highly recommend stopping at this local joint if you find yourself in Slidell. I’m sad to say, I forgot to take a photo of my food, but here’s one I snagged off Trip Advisor. For breakfast on Saturday morning, I got an Uber to Elizabeth’s which wasn’t open yet but already had a line forming outside. They’re noted for breakfast, especially the praline bacon. I opted for Bananas Foster French Toast and wow was it good. I couldn’t finish it all – the portions were huge. I was unprepared for the type of bread they used – it was more like a french bread and not the typical sandwich bread we all use here in the Midwest. Saturday night in New Orleans, I met up with my library director for dinner at Coop’s Place in the French Quarter. It was not what I expected! It was a tiny, hole in the wall bar but it had been highly recommended so we tried it anyway. I got red beans and rice and while it was good, I honestly think I’ve had better. It was still a fun experience and there are other things on the menu that look delicious too. Sunday I was way too busy to leave the convention center so I had pizza for lunch (boring) but Sunday night, I had my best meal of the whole trip at The Rum House on Magazine Street. They specialize in Caribbean infused taco dishes and of course, rum drinks! I got two tacos with plantains and black beans. SO GOOD. The jerk chicken taco was topped with mango salsa and the Carolina BBQ taco was topped with corn relish and BBQ sauce. There were so many to choose from. I probably should have eaten here twice because the menu is so extensive and it was hard to choose what I wanted. I also indulged in a rum punch that really hit the spot and also went well with my dinner. I thought about key lime pie but was too full to eat anything else that night. Monday was kind of my sleep in morning, so I skipped breakfast and once again ate lunch at the convention center because my afternoon was very busy with things to do. That evening, I decided to walk down to St. Roch Market, which was near my AirBnB. It was such a cute place and they also have a location in Miami. It’s located in an old factory that they’ve re-vamped and there are lots of different food vendors to order from and you can eat inside or out. It seems I can’t stay away from Mexican food, because I ordered a burrito bowl with street corn on top. I got a mint lemonade from another vendor and it made for a really delicious dinner. Saint Roch area is an up an coming neighborhood, so if you’re ever looking to escape the French Quarter, I suggest checking it out. Tuesday was my last full day in the city and I was all finished with my conference, so I met up with my friend Shana who graciously showed me around and did all of the driving for the day. We started the morning at Cafe Du Monde for some glorious beignets. After breakfast, we walked around the French Quarter then headed to Oak Alley Plantation (more on that in another post). We spent a couple hours there, then headed back to New Orleans, where we walked through their unique cemeteries before having lunch and ice cream on Magazine Street. I got chicken schwarma from Anatolia, which is a Turkish/Mediterranean restaurant along the main drag. The portions were huge! And there’s a really good variety to choose from. Finally, we ended our day with a scoop of ice cream from Sucre, a fabulous sweet shop with ice cream, macaroons and other sweet treats. Also located on Magazine Street, all goodies are made in house.